Secluded on Mt. Helicon in Greece, just south of Delphi, is the Monastery of Hosios Loukas (Holy Luke). 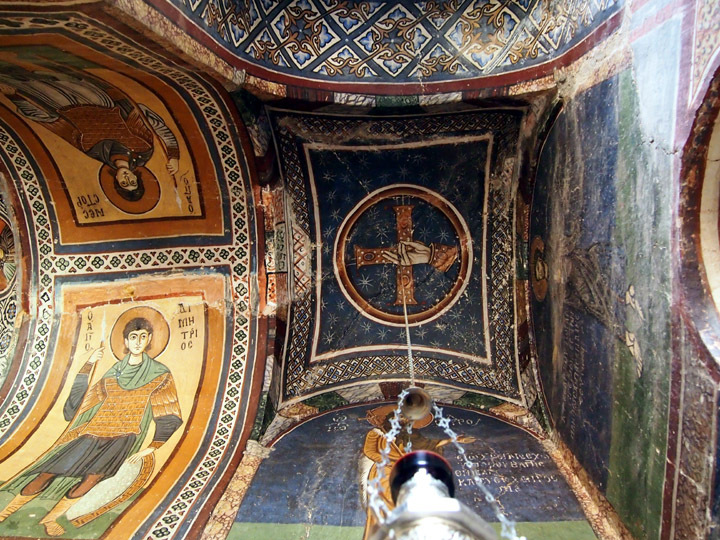 A triumph of Byzantine art and architecture, it is no surprise that this church is a UNESCO World Heritage site. Decorated with a combination of mosaics and frescoes, I made certain to stop at this church. 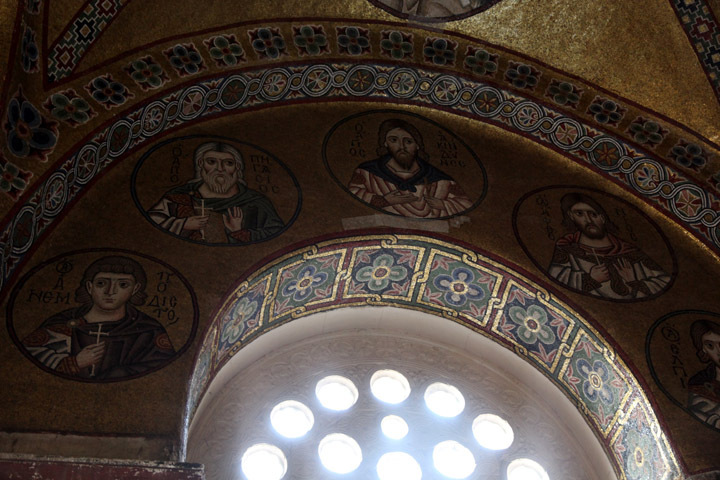 While its difficult to capture the feeling of being in such an amazing place, hopefully the images and music in this post will help transport you that beautiful place of marble and holy Byzantine faces. We often take art images as the absolute sensory experience because it is so hard to replicate the original context. 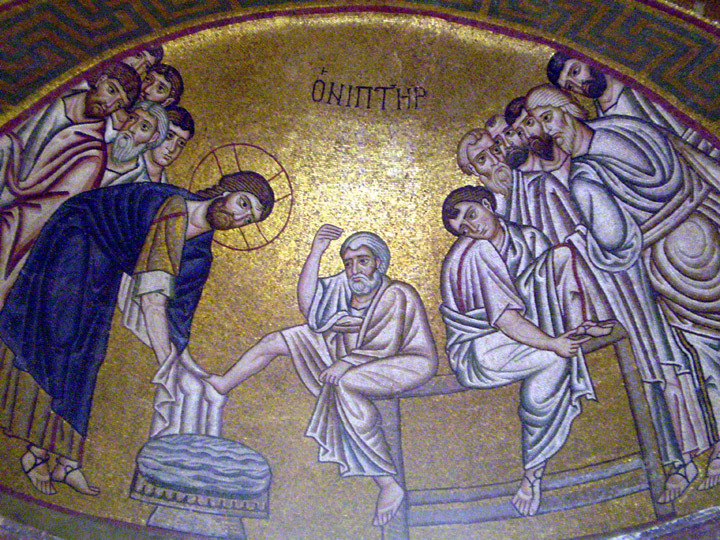 But how much better would Byzantine mosaics appear if lit by candle light and seen through a thin haze of incense? While I can’t do much about the smell through the internet, we can ponder the art while listening to some typical Greek Orthodox chant. The National Gallery of Art in DC recently hosted a historical choral group in conjunction with their Greek Art exhibit and it was an epiphany to hear the music with the art. This acapella music lends a sense of mystery and mysticism to the incredible images and architecture which one would might normally feel on-site. So now, a Greek Psalm from ca. 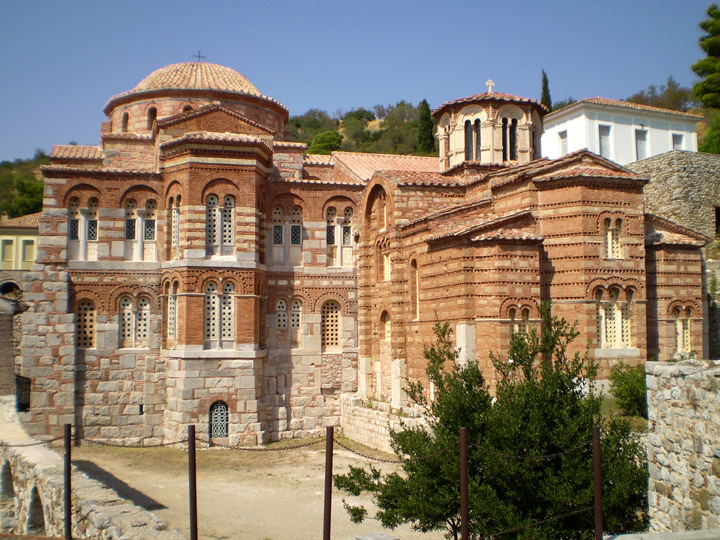 1162-1179 AD sung by Cappella Romana to accompany this walk through the Hosios Loukas Monastery. View from the east of the exterior of the cathedral. Following the death of the holy hermit Lukas the Stiriote, a church was constructed in the late 10th century on Mt. Helicon to house his relics. Later in the early 11th century, an immense Byzantine-style square cathedral was constructed adjoining the Church of Holy Luke and was used to support the growing religious community and pilgrims there. The cathedral has a massive central dome which rests on 8 hemi-circular vaults (or squinches) and thick piers. 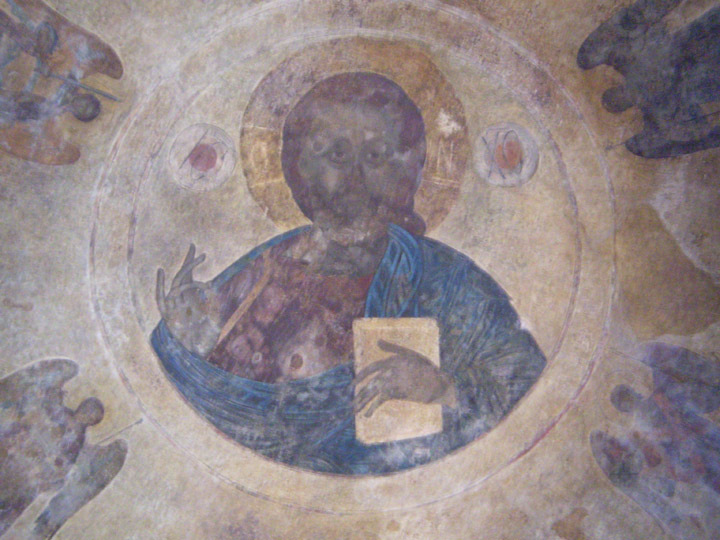 Faded but intense Christ Pantocrator image from the center of the dome. There were four incredible mosaics in the squinches. Unlike the image above which wraps around the curved base of the dome, the image below must accommodate a sharp corner along the bottom where the two straight walls intersect. Covering this significant contour must have been a technical challenge for the artist but the final effect seems effortless. There is a single aisle around the central worship area which then sub-divides into small chapels. 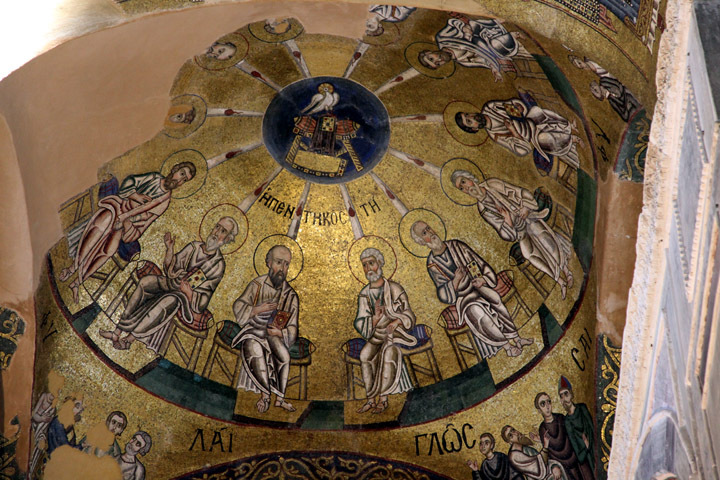 Most of the incredible mosaics and frescoes have survived so one wanders through the church under the watchful eye of dozens of saints and angels from the 11th and 12th centuries. 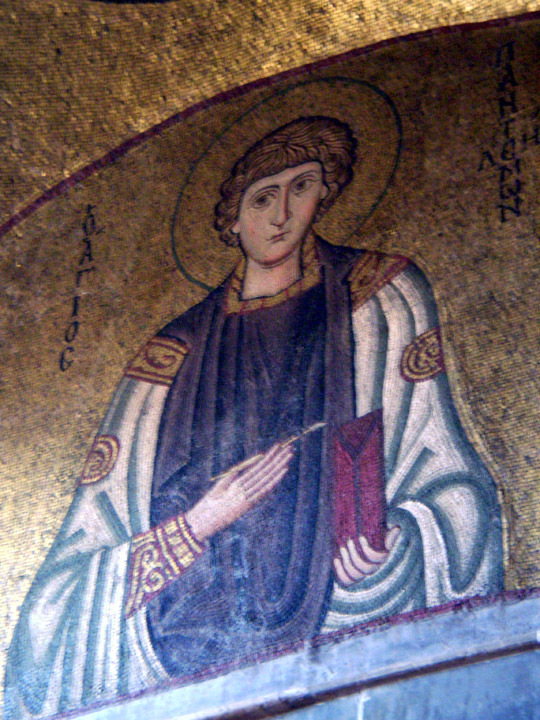 Mosaic of St. Pantaleon. A healer and early Roman martyr, he is shown with a medicine box and a small spoon or scalpel. 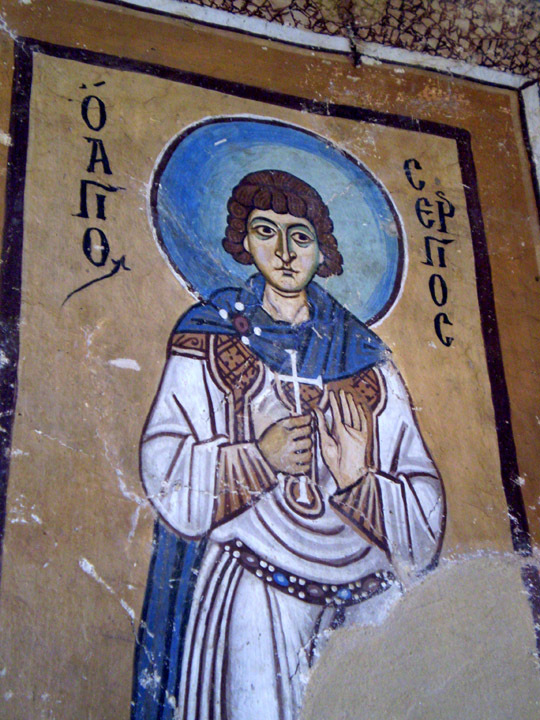 St Sergios fresco. He was a successful Roman soldier who was executed ca.303 AD after converting to Christianity. 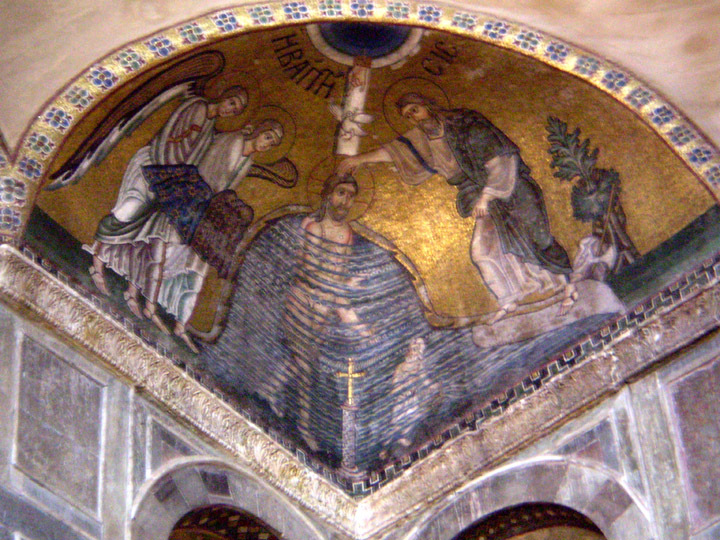 The Narthex contains a very compete and elaborate mosaic cycle. The relatively small space shines from all the gold tiles used in the images. 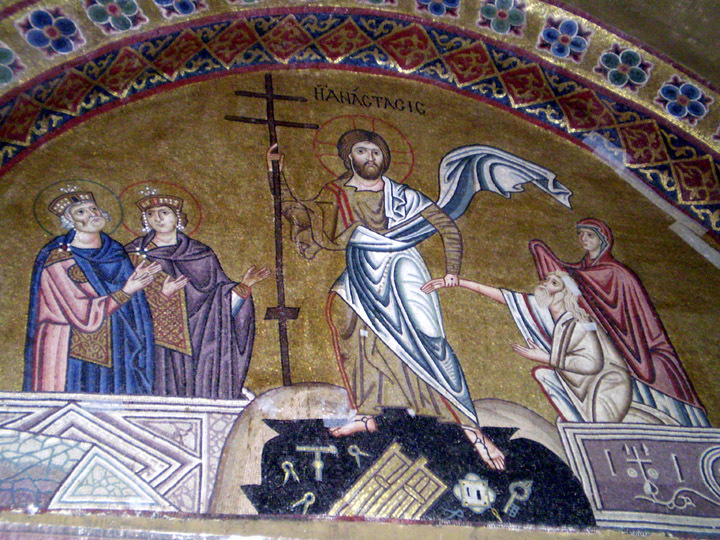 Christ Raising the Dead mosaic from the Narthex. 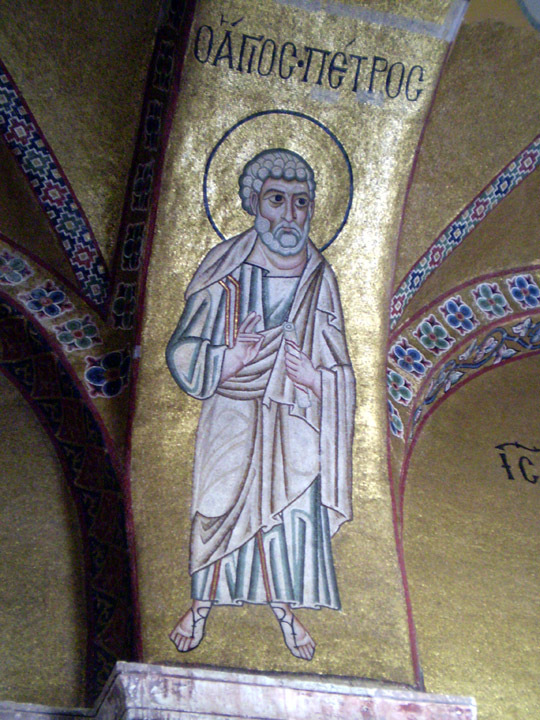 St. Peter mosaic from the Narthex showing the important apostle with a white beard but without keys which is his typical Western iconography. 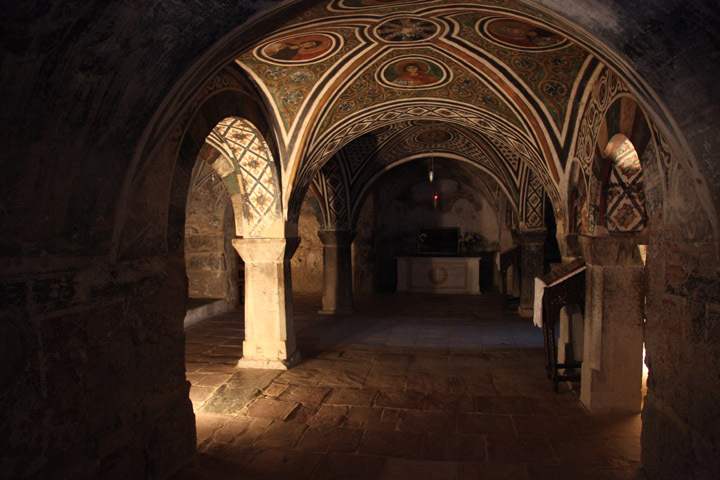 Beneath the cathedral is a dim crypt decorated with dark frescoes. The walls are decorated with the Passion story which in many places had been damaged. Given some of the 19th century graffiti, it is hard to tell exactly when the images were altered. 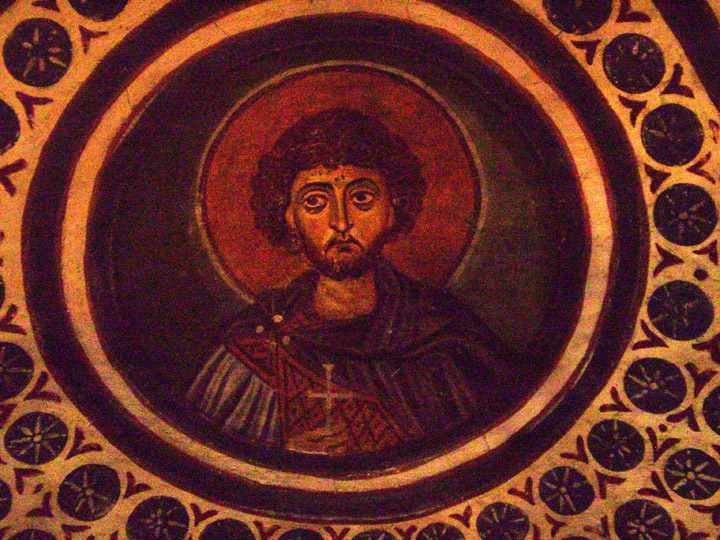 Saint fresco from the ceiling of the crypt. 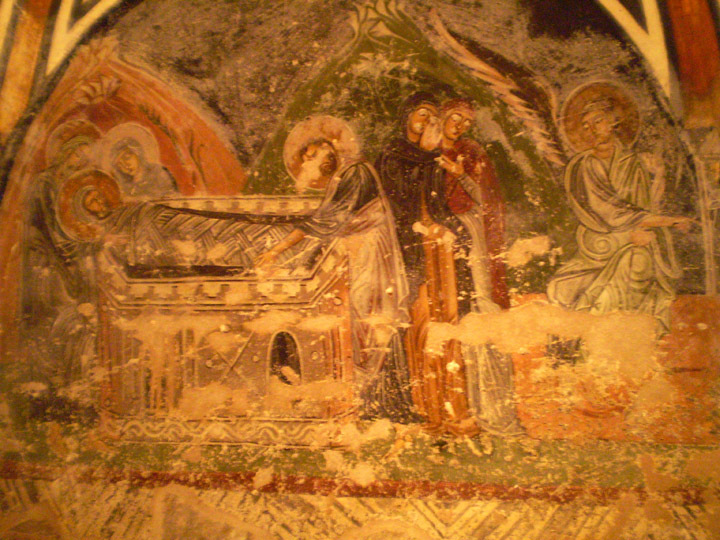 The passion story is frescoed throughout the crypt. Many of these images had been purposely damaged as you see from the gorged out eyes here. I hope you enjoyed that look through the Monastery of Hosios Loukas! Of course, I hope you get the chance to see this incredible cathedral in person some day. Just remember to bring your own music for the full experience. I guess that the feeling of being in such a jewel would be amazing, but reading your wonderful post with Byzantine chant as soundtrack is amazing too. Thank you for your eternal good taste, Christina! Thank you! You are too kind! I wish I could take everyone traveling with me, but since that’s not very practical, I do the best I can to share. 🙂 Glad you liked the music! Glorious post, Christina! The mosaics and music are stunning. you helped tremendously on my assignments for school. I actually switched my Spotify radio station to Byzantine Psalms! It really brings you into learning about this stuff. I wish you the best and thank you for the great, insightful article!